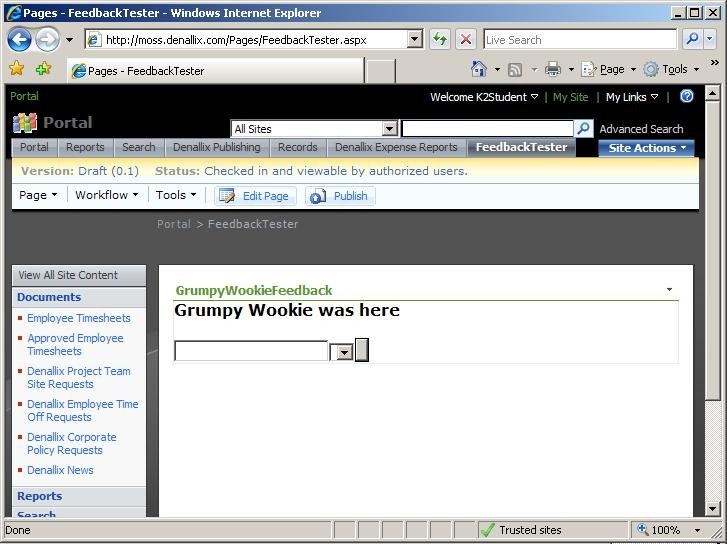 When implementing a WebPart in SharePoint 2007, make sure (firstly) that you actually NEED to do more than just some simple HTML – otherwise you’d use a Content Editor WebPart (or similar). A WebPart is a mini web page (like an ASCX web user control in ASP.NET-land). As we saw in this post, getting the deployment happening is a fair battle – now we’re ready to add some functionality. 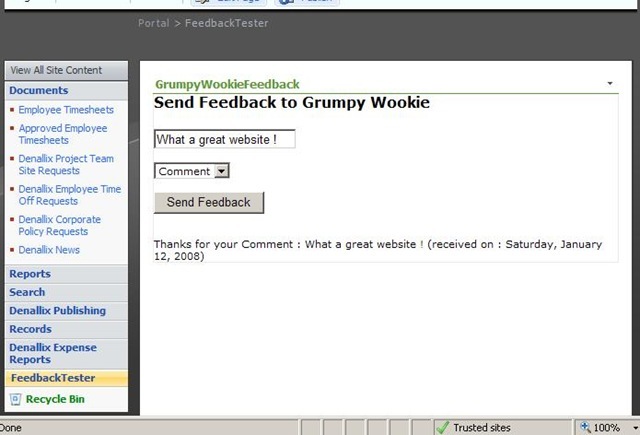 The following example builds on the “GrumpyWookieFeedback” WebPart from this post. Scroll below for a download link (zip). When a new control is created, there is ONE event added : Render. This is an override method, inherited from the “System.Web.UI.WebControls.WebParts.WebPart” interface. We’ll add a new line using the “RenderStartTag” method of the HtmlTextWriter. There are a LOT of “write” methods – such as WriteAttribute, WriteEncodedUrl, WriteFullBeginTag – and so on. Best to experiment to see which works for your specific need. OK – No more “hello world”. 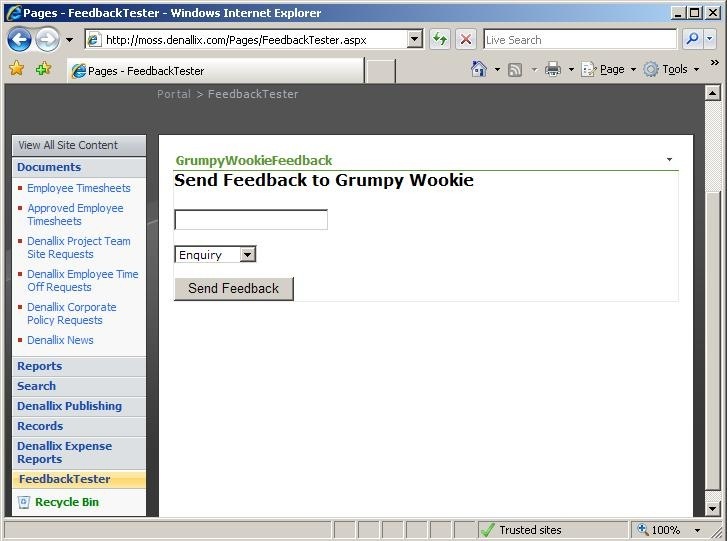 We need the GrumpyWookieFeedback WebPart to have some functionality. In this example – I’ll add a textbox, dropdownlist (with some options) – and a button. NOTE – you can’t just ADD the controls directly from within the “Render” method. You have to add them to the “controls collection” for the WebPart. To add your own ASP.NET server controls, you include an additional method (that doesn’t get added initially). This is the “CreateChildControls” method – in which you add the code for controls such as DropDownLists, Buttons, etc – and define the properties for the controls – and any events that they will respond to. Again, this is an “override” method – you’re basically building up the WebPart to operate the same as all other SharePoint controls work – well, duhh. You then have to define the controls within the class – not within the Render method – or the CreateChildControls method – they need to be “global” for the class. Once again, make sure you define the controls at the “class” level. The last line is important for the “interface”. It tells SharePoint that the method has completed, and controls have been added to the collection. Refresh your test page, containing the new WebPart control. Where are my controls ? If you’re wondering why the ASP.NET server controls are NOT appearing, that’s because they exist within the “controls collection” – but they haven’t been “Render”ed out to the page. You need to include some code to spit out the controls similar to how the “H2” and text were included (above). That all looks nice and fancy, but nothing happens when you click the button. That’s because we haven’t added the code for the “event handler”. We can now include some code to perform when the user clicks the button – such as send via an email, or log to an XML file – or add an item to a SharePoint list – or redirect to another page – or whatever. You can easily add much more complex functionality – and layout – the only trick is having to actually write the specific controls using code. I’ve bundled the example project into a zip file – click here to download. Next Article Get outta MySite !